Happy Tuesday morning! 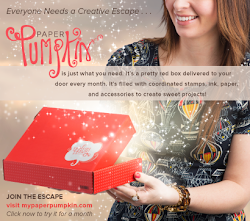 Today I thought I'd share some of the projects I've created so far with January's Paper Pumpkin kit. 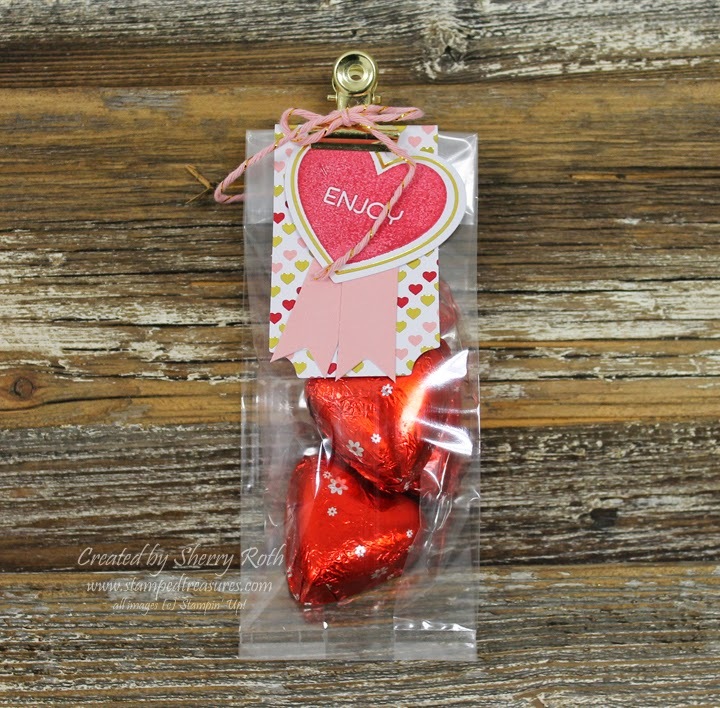 The kit came with enough supplies to create 24 of these adorable little treat bags (clips, bags, die cuts, stamps and inks) - everything except the candy! What an awesome value at only $24.95 + tax! I plan on making some of these little gifts for everyone who's coming to an upcoming party that I'm having this weekend - as a little thank you for coming. I knew I wouldn't use all 24 of them as treats so I decided to create a couple other things with them. Both of these next two projects were inspired by Mercedes Weber. I love everything she creates! 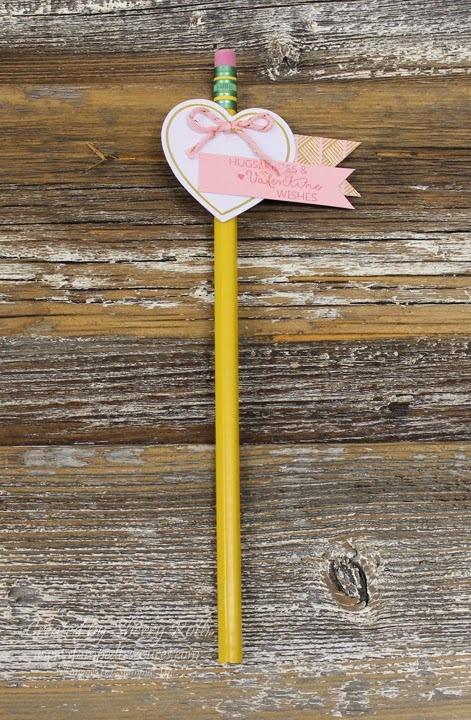 I used the die cut heart and a couple of the flags to decorate a pencil. 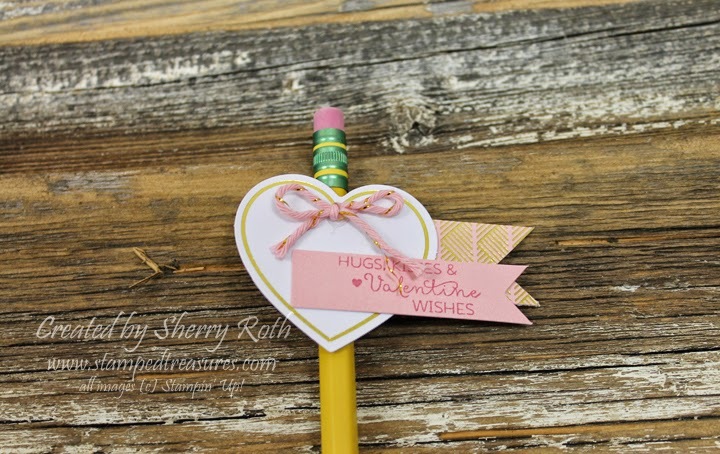 Perfect for valentine treats for kids who can't bring candy or chocolate to school! Don't give out treats? How about using the pieces to create a card? The only things that weren't included in the kid were the note card and the gold sequins - everything else was in the kit! I am loving these kits - I know I say this every month but I really believe they are spectacular value! And it's so great to get a little surprise in the mail each month. Did you know that during Sale-a-Bration you can purchase a 3-month prepaid subscription and save $5 ($68.85) and that that qualifies you for a free Sale-a-Bration product?! No better time than to give it a try right now. Ready to order a 3-month subscription? Visit my online store and enter product number 137859. I have one more project to share with you that I created using January's kit but I'll save that for the weekend:) Have a creative day!